I have a great trailer, but it feels a bit flexy, maybe even rickety . . . How can I strengthen a trailer frame? How can I stiffen it? It’s not uncommon to repurpose a trailer, or to find a reason for a trailer frame that needs new life. And, some trailers just feel a little rickety, so let’s look at ways to stiffen and strengthen a trailer frame. First, let’s make sure we’re in the right place. There are two different needs for greater strength or stiffness. The most common is a trailer that’s flexy, or feels a bit rickety. The other is to increase load capacity. Both are needs to strengthen a trailer frame, but the approaches are different. A trailer that feels flexy might be a frame that is repurposed, or a bolt together design that’s seen tough miles. Or, it might be an inexpensive trailer that folds up. Whatever the source, it now feels under designed. In this post we’ll look at stiffening aspects to strengthen a trailer frame. A trailer that needs greater load capacity may well be sturdy for its current capacity, but now you want it for more. If you need higher capacity, please read Increasing Trailer Load Capacity. Please Note: Sometimes the two strengthening needs mix, so we recommend you read both articles. Two more related needs for strengthening are making a trailer longer or wider. Changing the existing configuration is different from strictly strengthening or stiffening, but they are related, so we’ll address those in the future. Please stay tuned. Rickety and Wangly are a couple of fun words to describe something that is not all together solid feeling. These words don’t mean falling apart, though something falling apart certainly will feel rickety or wangly. The solution to falling apart with trailers is to put them back together — tighten bolts and/or fix broken welds. After fixing the broken or loose things, then the harder part begins. This article is about making the trailer feel stronger or more solid when it is all together. Some good background reading is the article on Using the Right Materials for various parts of the trailer frame. Also read about Safety Factor in choosing trailer frame materials. By The Way: If you’re building a new trailer, include generous stiffening. It will pay big dividends later when you’re using it. Our Trailer Plans have several stiffening items, and we recommend you think about it when building a trailer frame. This is especially true when your trailer will carry something really important like a Tiny House. Typically, the most flexible portion of the trailer frame is the corners or intersections of beams. If the flex is in the beams themselves, then change directions and read about Increasing Capacity. The way to tell is by making the trailer flex. Test it by jumping up and down on a corner of the trailer, and see if ONE corner moves a lot more than the others. Or, perhaps when jumping on one, then the opposite corner moves a lot. That’s a trailer that needs stiffening. Strengthening the Trailer Frame Corners is the First Step to a more Rigid Trailer. And, as seen in the image, a corner may not be a true sharp corner. This image shows a gusset installation on a beveled corner. If you like building stuff, gussets and angle braces are big-time friends. They come in hundreds of varieties, and they all strengthen and stiffen corners and intersections. They’re great on trailer frames and just as necessary in avoiding Gantry Crane Failures. The First incarnation is the simple flat plate of steel bracing the corners. These are ‘Horizontal Flat Gussets’ and they give strength to the frame laterally. Usually they are cut with 45° ends and welded in, but make the angle fit the need. Best Use: Short spans, and tight spaces. 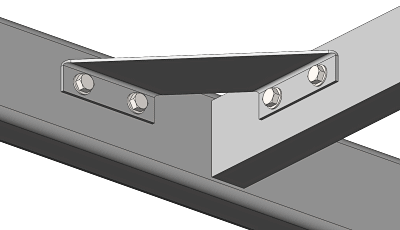 The Flat Horizontal gusset is great if your trailer bolts together, yet needs strength in the joint, because you can easily fabricate a gusset to bolt in. These drastically stiffen a corner. The Second option is similar, but places the gusset vertical. This gives more “twisting” rigidity to the trailer frame joint. ‘Vertical Gussets’ like these provide much of the lateral stiffness of a Horizontal Gusset, but also add a little more twisting stiffness. It’s easy to make a bracket like this as a bolt-on by adding bolt tabs on each end, but bolting does negate some of the twist stiffening. Best Use: Short span, and welded designs. A Third type uses ‘L Bar’ (commonly ‘Angle Iron’) to give stiffness like a combination of the above two options. The big advantage is the L shape adds stiffness to the gusset itself allowing a longer gusset or a little thinner material. Best Use: Longer spans, stiffer than flat. 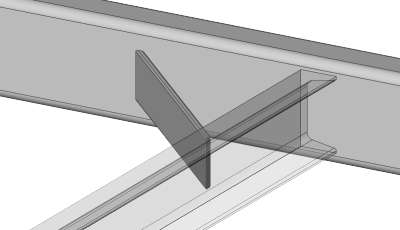 And a Fourth type is a closed section beam which gives stiffness in 2 directions as well as torsion. This is a combination of all the above plus some. If you have a choice and want a lot of bang for the buck to strengthen a trailer frame, weld in some like this. Best Use: Longer spans, and maximum added stiffness. Gussets of many types, all with different best uses. The beams of the frame also help with stiffness. Not just the main beams, but the cross members too. They carry vertical loads, and they carry a torque load when the forces are uneven. That is one aspect of how a trailer is stiff when jumping up and down on on corner. All frames will flex a little, and that’s OK, but it should not be a lot. 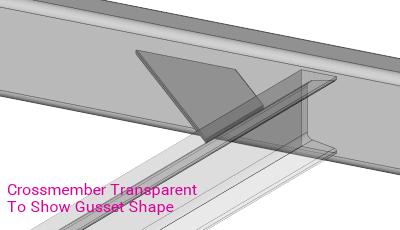 Each beam shape (profile) has a purpose. 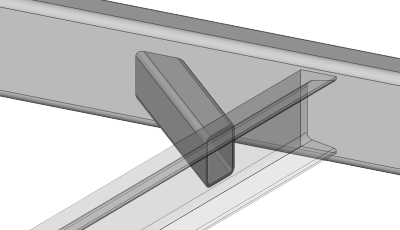 To increase the torque carrying capacity, add tubes as cross members — rectangular or round. These are sometimes called torque tubes because they carry torque from one main side frame rail to the other. Example of a Torque Tube (Red) in a Trailer Frame. This is a Large, Heavy Duty Frame with a Very High Stiffness Requirement. Three such Torque Tubes are along the 30′ Length. Note that round tube crossmembers are not as easy to connect to — like to bolt the bed material down. Squares of similar size give nearly the same torsional stiffening effect. Finally, continuous sides (especially when welded) will strengthen a trailer frame. It may be obvious, but the biggest stiffening effect for a trailer frame comes when it is welded rather than bolted — especially when reinforced with a few gussets. Bolting is nice for taking it apart, and it is easier to assemble. Yet, often the only reason for bolting is for shipping prior to assembly. If getting it to you is the only reason for the bolts, then weld it. Yes, welding means removing paint, then re-painting after. The decision to do that is a matter of how much you want stiffness and strength. However, as noted above, welding is not the only way. Bolt-on gussets add both strength and stiffness, so if you don’t want to weld, add some bolt-on strengthening members. See above for some simple bolting gusset ideas. Also, a great example of a strong bolt-on gusset is in the image from this blog about his project. Bolting does require some added thought and some common sense for getting it right. Sometimes the best answer is to have some areas welded, and others bolted. The folding trailer(s) sold through retailers like Harbor Freight have been popular for years. They fill a light duty niche in the market with an inexpensive, functional product. As much as people love them, they are also the target of a lot of complaints about stiffness. A common need to strengthen a trailer frame comes with these fold-up trailers. Harbor Freight type trailers are not bad when they’re new, but after being used a bit, they typically do become a little rickety. See above about bolting and welding. Note: According to someone on Bogleheads.org, Harbor Freight folding trailers are no longer available. Interestingly, it appears folding trailers from Northern Tool are also not available at time of this writing. Let us know why if you have inside information. Seems like that’s a niche to fill. 1st and easiest — install new plywood decking and tighten all the bolts. The decking is a very effective gusset if it’s tight and secure. Thicker plywood will give more stiffness. Use washers on the plywood for better clamping (so it does not just pull the bolt head into the wood). One of the best online descriptions about modifying a fold-up trailer — while maintaining the folding function — is on this blog. 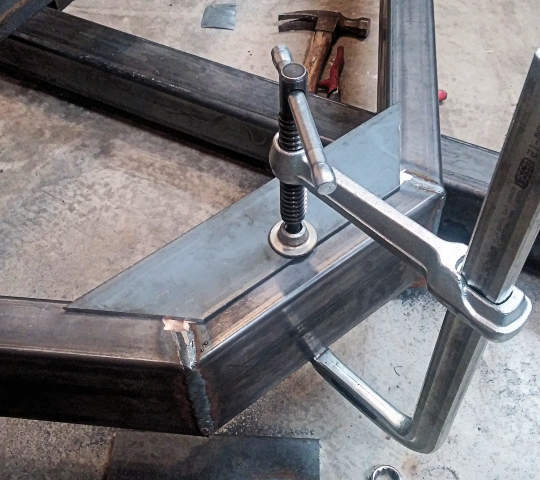 The image (from his blog) shows an example of a his quick gusset welded into the corner to strengthen a trailer frame. 2. Add in gussets. If you’re bolting them in, use the Second style of gusset as above. If you are willing to weld, do the Fourth type. 3. If you ARE willing to weld, weld all the joints — except the folding joints (if you want to preserve the fold-up feature). Welding joints that are not involved in folding will not harm the function of folding, yet it will stiffen and strengthen the trailer. You just won’t be able to take it apart. 3. If you are NOT willing to weld, tighten bolts. If they don’t have them already, use nylock or other locking fasteners. Maybe even add a few bolts if you see good places for them. 4. If you don’t need the fold-up feature, weld stiffeners (like strips of metal) over and under the joints extending at least 16 inches either side of the joint. The folding joints are a big source of “rickety” on these fold-up trailers. The other option is to bolt the joints better. 5. Permanently attach the sides and make them continuous from front to back. Good Luck With Your Trailer Stiffening Project! Trailer Lights and Wires Mother of Invention? Thanks for the info update. Much appreciated. Had to call several stores…but finally found one in the Chicago market. They are far and few in-between, but can be had!